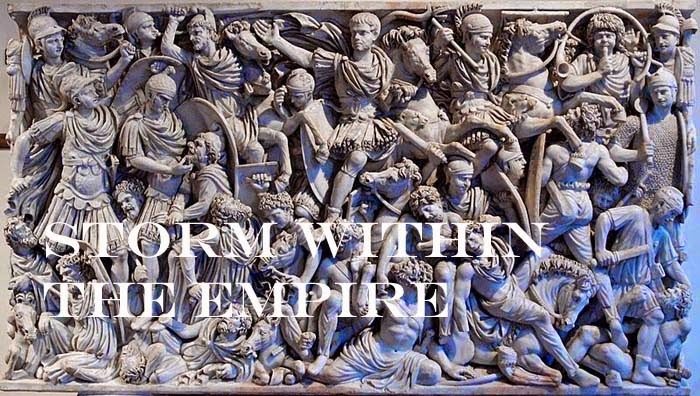 Storm within the Empire: Project Rome – about the timeline. Project Rome – about the timeline. To design a campaign and scenarios based on the events in Hispania I have sorted out 20 pages of notes from Livy’s History of Rome, primarily from volumes five and six. These volumes cover the period from 193 BC to 166 BC and up to 105 BC there are only fragments of ninety-five books. Livy is methodical in his recording the proconsuls and their assignments to each of the two provinces and he gives also the number troops raised as new legions to to replace serving legions operating in the two Spain's. Do be aware that assignments to the provinces were for a term of one year and in rare situations could the term be extended for another year. To add to the confusion, many offices were held by prestigious families so we encounter similar names but are actually different persons. Further, it is possible to encounter the names of four officials in Spain and this is due to a proconsul (governor) assisted by a praetor, and if necessary, both might serve in the field. In these cases, each Spain would have a consular army serving in it. In a previous post, I described the consular army comprised to two Roman Legions and two Latine legions; split between two commanders this would give a reasonable sized force of 10,000 to deal most tribal forces. In those rare moments when Hispania did experience peace Rome was vigilant to take advantage of the situation by reducing the two districts (Hither and Farther) to make as one and subsequently reducing the military forces serving there. Rome fielded armies comprised of citizen militia augmented with Latin auxiliaries and as such, these troops served for a year which meant a regular rotation of new recruits to replace those who have completed their terms. Of interest are the numbers quoted for Latin troops as being higher than those of the Roman legions; this may be due to the need for troops to fight in the many mountainous regions of Spain. In addition to the numbers of Roman and Latine troops we encounter the term “auxiliaries”, which I read as loyal troops coming from the pro-Roman provinces in Spain. Peace treaties did not last long and we read that several years may pass before another chieftain rallies neighboring tribes to take up arms against Rome. Rome or more correctly certain consuls were at times responsible for acerbating the situation by their over zealous methods in maintaining order. Following the 2nd Punic War to the rise of Marius, historians have grouped many of the small conflicts into the three major wars; the first Celtiberian war, the Numantine War and the second Celtiberian war. Which ever name given, the conflict following the 2nd Punic War was continuous and tenacious which would not be resolved until the reign of Augustus Caesar. Tomorrow, the Timeline Hispania 193 BC to 180 BC (part one).